A jury found a Bank of America unit and executive liable for mortgage fraud. You might think $165 million of fraud would put someone in prison, but you’d be wrong. JPMorgan will pay the government $13 billion for misleading mortgage practices but again, Justice is doing nothing tacky like filing criminal charges against those responsible. It’s just so much easier to fill the coffers with the bankster’s ill-gotten gains instead, something which is also known as bribery. If they went to prison and the criminality stopped, then there would be no more government income from the fines. And they can’t be letting that happen. Revolutions all over the world have been demonstrating just how critical the internet is to the modern world. It can be used to oppress and it can be used to free people from oppression. Wikileaks and other websites like it show how technology can be used to promote secrecy or to promote transparency. Here is an exclusive peak into why the federally mandated home modification program HAMP (Home Affordable Modification Program) isn’t working (http://www.makinghomeaffordable.gov/programs/lower-payments/Pages/hamp.aspx) for the overwhelming numbers of the 99% people who need it. 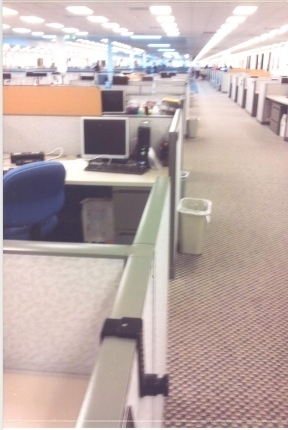 If you empty the cubicles of most of the workers who are supposed to process HAMP modifications nothing will get done and nobody will be helped. A Bank of America whistle blower sent the photo to India. This is where being a private investigator for over 30 years and having served more than twice as long as Chairman of the Board of CALI (California Association of Licensed Investigators, the world’s largest organization of private detectives) pays off:Â it went right to somebody in my international network of private eyes, spies, and other assorted sleuths and came right back into my inbox. I blogged previously about the former Countrywide Mortgage (now acquired by Bank of America) executives who gave campaign contributions to the Financial Crisis Inquiry Commission Phil Angelides and how one former Countrywide executive had to be talked out of having me murdered by his lawyers:Â http://janbtucker.com/blog/2011/12/22/radicalism-is-the-conservativism-of-tomorrow/. That blog apparently prompted a new whistle blower to come forward with the interesting tidbit about how Bank of America is cutting costs while insuring that the HAMP operation will accomplish little or nothing for the American people. It’s not like sacking everybody made the operation work substantially worse though. All it has done is make it working more atrociously than before. As of 2009 the statistics were that Bank of America only allowed 4% of its applicants to actually modify their loans:Â http://www.consumerwarningnetwork.com/2009/08/31/home-loan-modification-run-around-continues/. Bank of America probably figures that statistically, getting rid of most of its loan modification employees won’t even be noticed and can be attributed to the length of time that the program has been in operation. Company executives can always tell congress that they’ve already processed all the meritorious qualifying applicants and so that’s why their percentage of approved modifications is slacking off. President Thomas Jefferson said that “I believe that banking institutions are more dangerous to our liberties than standing armies.”Â This danger became self-evident when former FBI Cril Payne wrote after leaving the agency that the February 25, 1970 burning of the Isla Vista (Santa Barbara) Branch of Bank of America by anti-war students was actually instigated by the FBI’s COINTELPRO program. 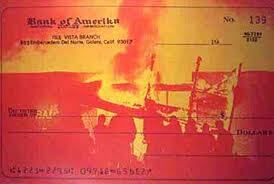 Legitimate protests against Bank of America’s support for the Vietnam War was exploited by the government to discredit the anti-war movement by instigating acts of vandalism and violence. 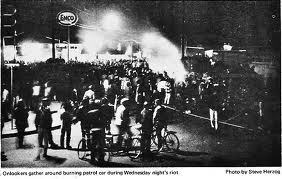 Later that year, in April 1970, the police wound up shooting UC Santa Barbara student Kevin Moran while he was trying to put out a fire at the temporary Bank of America facility set up after the February 25th incident. A couple of buddies of mine from the California Peace & Freedom Party were at the February 25, 1970 event. One, Gay activist Sandy Blixton, liberated a ream of Bank of America letterheads from the trash the day after the bank burning. It had been in the vault and so had survived the fire, but was considered garbage by the Banksters since it had been singed all around the edges from the heat. Sandy sold each of the 500 letterheads for upwards of $100 each to anti-war activists as souvenirs to finance his continuing actions for Gay liberation and against the war”¦..at least some decency came out of this otherwise indecent fiasco. God forbid we should ever be twenty years without such a rebellion. The people cannot be all and always well-informed. The part which is wrong will be discontented in proportion to the importance of the facts they misconceive. If they remain quiet under such misconceptions, it is a lethargy, the forerunner of death to the public liberty. We have had thirteen States independent for eleven years. There has been one rebellion. That comes to one rebellion in a century and a half for each State. What country before ever existed a century and a half without a rebellion? And what country can preserve its liberties if its rulers are not warned from time to time that their people preserve the spirit of resistance? Let them take arms. 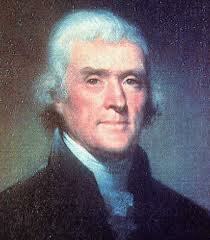 The remedy is to set them right as to facts, pardon, and pacify them. What signify a few lives lost in a century or two? The tree of liberty must be refreshed from time to time with the blood of patriots and tyrants. It is its natural manure. Triumphalist liberals proclaim mission accomplished in Libya even as battles still continue in Tripoli and the National Transitional Council draws up a constitution for a strict Islamist state under sharia law. And then there’s the problem of 1000x more loose weapons than under Saddam. Libya is nowhere near being stable much less having a functioning government. Bank of America teeters badly as Warren Buffett loans them $5 billion at steep rates when they could have borrowed elsewhere much cheaper. They choose his loan because it implies his support. But BofA has $100-200 billion of toxic slop on their books, so $5 billion is just chump change. The Obama Administration changed the accounting rules for big banks so they don’t have to mark-to-market. Until this deception is stopped, the pretend-and-extend charade will continue – until it no longer can. Fracking has been decisively linked to earthquakes in many areas. When it was banned, earthquakes decreased. Imagine that. There’s been quite a lot of fracking in Virginia. The earthquake was no coincidence. With Steve Hynd , Keith Boyea, and myself. Bank of America, the largest bank and 5th largest corporation in America is reported to have paid zero federal income tax in 2009, funneling its income through 115 foreign tax-haven subsidiaries. BofA and other large financial institutions take billions in bailouts from the government yet pay little or no taxes. This is regulatory capture. Our tax laws have been corrupted by special interests so that big corporations can avoid taxes thus dumping the burden on the rest of us. Sounds like financial terrorism to me. This is a protest anyone, regardless of political affiliation, can get behind. Most large corporations in the US pay little or no federal income tax. US Uncut is targeting Bank of America, who received billions from the government last year yet pays less taxes than the average US household. If this happened in any other country, we’d call it corruption of the government by corporations, wouldn’t we?